Antique diamond engagement rings aren’t easy to find. But that hasn’t stopped many soon to be married couples from seeking them out. Antique diamond engagement rings are perfect for couples who want a traditional diamond, but who also want an antique ring. These rings aren’t easy to find because diamonds weren’t always as popular as they are now. Most modern couples want diamonds for their engagement rings, but couples of the past didn’t care that much about diamonds. It’s hard to believe, but it’s true. Diamonds weren’t always as popular as they are now. That’s why many antique engagement rings contain rubies, garnets, or other precious stones. Why are genuine antique diamond engagement rings scarce? Couples were getting engaged long before diamonds were readily available to use in jewelry. People used rubies, emeralds, sapphires, and other gemstones regularly. That changed somewhat after Africa was discovered to have an abundance of diamonds. Jewelers recognized the opportunity, and started creating more diamond pieces. As with anything new and exciting, the demand for diamond engagement rings soon skyrocketed. Along with high demand came high prices. Engagement rings with diamonds cost hundreds of dollars more than the same rings with different gemstones. As a result, only the wealthy could afford diamond engagement rings. So of course, diamonds became a status symbol. Unlike today, back then wearing even a small diamond meant you were wealthy. Seeking to cash in on this trend, jewelers began making more and more diamond jewelry. You could get everything from rings to bracelets. However, the party was over when supply began to outweigh demand. With an abundance of merchandise just sitting around, jewelers started lowering their prices. As diamond engagement rings and jewelry became more affordable, diamonds ceased to be a big deal. When the diamond craze subsided, many couples returned to using gemstones other than diamonds. That’s why it’s not easy to find genuine antique diamond engagement rings. They exist, but they’re not as abundant as non-diamond antique engagement rings. Diamond rings became popular again by the mid 20th century. They’re still very popular, and will probably remain so. As long as celebrities and the wealthy continue to wear large diamond rings, popular culture will follow. However, some couples are deciding to ignore tradition and pick gemstones other than diamonds. Antique diamond engagement rings are those that are 50-years old or older. You have to know a bit about antiques in general to spot genuine antique diamond engagement rings. Otherwise, you can easily be fooled by a con artist. If you’ve ever watched Antiques Roadshow on television, then you know it’s not uncommon for people to pay thousands of dollars for fake antiques. That’s an expensive lesson you don’t want to learn the hard way. 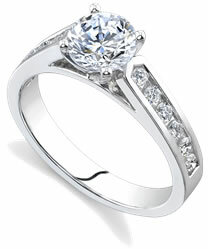 You may want to consider a new diamond engagement ring in an antique diamond ring style from Novori.com. That way you know you will get the best quality in a new diamond ring. Look below for a list of the most common eras for antique engagement rings. The earliest date listed is 1837, but it’s possible to find rings produced even earlier. However, much older rings may be more fragile or in bad shape. Antique diamond engagement rings from the early Victorian era are rare, but not impossible to find. The Victorian era existed from 1837 to 1901. During this time is when diamonds first became popular as engagement ring stones. If you can find an authentic ring from this era that’s also in great shape, consider yourself very lucky. The Edwardian era existed from 1901 to 1920. Antique diamond engagement rings from this era are slightly more difficult to find. Diamonds weren’t all that popular anymore, and were mainly used as side-stones to compliment gems such as sapphires or rubies. The Art Deco era existed from 1920 to 1930. Antique diamond engagement rings from this time period will be pretty recognizable. The Art Deco period was characterized by odd, boxy shapes. The good news is that diamonds were popular again, so it shouldn’t be too hard to find authentic antique engagement rings from this era. Antique engagement rings can be a great find if you know what to look for, where to look and how to properly identify the real ones from the fake. If you to be sure of the ring you purchase you should consider an antique style engagement ring from Novori.com together with a certified diamond. We have one of the best diamond selections available online and prices that cannot be beat. Our engagement rings are custom made in the USA for the quality and value you expect. Trust Novori Jewelry with your diamond engagement ring purchase and you won't be disappointed. Call us any time for assistance toll free at 1-877-877-4141.